With environmental issues on the forefront of many peoples minds these days, there has been an increase of children’s literature on the subject. 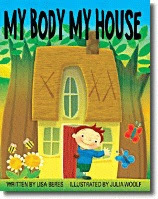 My Body My House is one such book that focuses on the choices we make in our home that affect our body’s health. Written by Lisa Beres and illustrated by Juila Woolf, My Body My House addresses “sick building syndrome“, suspected as being responsible for almost half of the illnesses in this country. My almost six-year old daughter enjoyed My Body My House; however, there were a few aspects of the book she said she would have changed. First, the text does not follow a consistent rhyming pattern. Some lines rhyme, some do not. When reading orally, a rhythm begins to develop on some passages, only to be abruptly changed a few lines later. In addition, it bothered her that the character was referred to as the Body throughout the book. I understand the author’s choice of the Body to reinforce the parallels between our homes and our bodies; however, this choice created an awkard storytelling experience. The goal of the story to educate parents and children about the relationship of our homes to our health and the environment is good, yet the awkardness of the text makes me think this book will not stand the test of time as a great environmental children’s book. The illustrations match the light, whimisical text well. If you would like to read more of this review, please visit Green Options: Green Family Values: My Body My House Review. That looks like a great book and it especially fits in with what’s going on in our life right now. We’re in the process of trying to move because of mold issues. The whole house has been in turmoil for the last six months because I’ve chosen a path to take me back to nature and a more simple lifestyle. The children and husband haven’t been happy watching 90% of their toys and extra junk making their way out the door, LOL. Well, I support your efforts Ami! Moving is also a good time to make such changes.